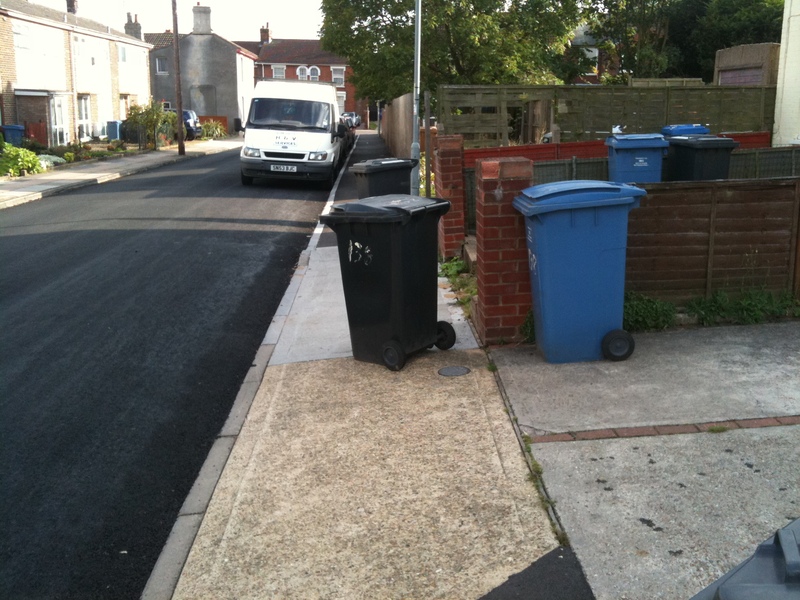 The official bin-collection policy of Ipswich Borough Council policy is to leave bins after collection ‘at the very back of the pavement on the curtilage of the property … not obstructing residents’ driveways, preventing usage of drop kerbs etc‘. I have asked them why they don’t return the bins to where they found them (which is normally within the curtilage of the property on a driveway) and have also reminded them of their duties to the blind/wheelchair users and other groups under disability legislation. The response was: “We have discussed your interpretation of the Equalities Act with our resident equalities expert and we are of the opinion that we are taking the best possible action in this respect“. Umm… Strange, given that the work ‘pedestrian’, ‘wheelchair’ and ‘buggy’ don’t even appear in the text. Here is my proposed replacement text: “a) Bins MUST NOT be left in a position where they create a safety hasard. 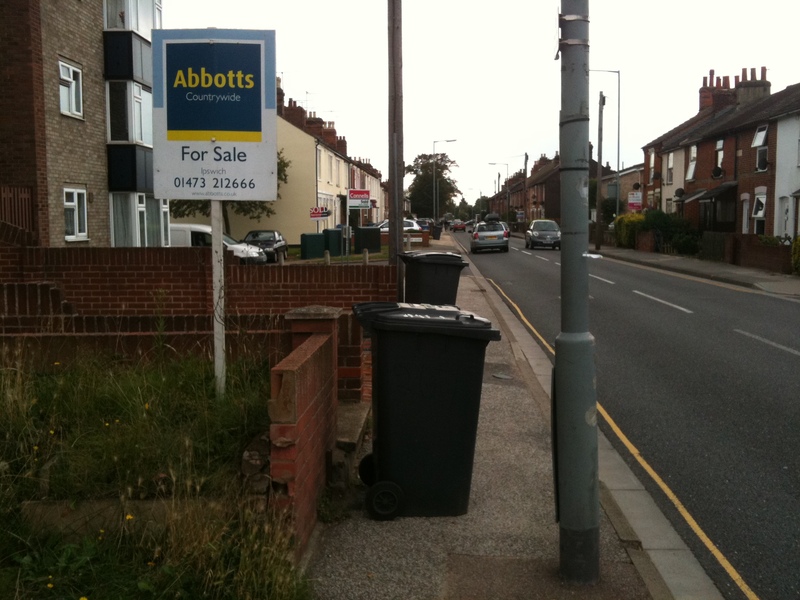 b) Bins MUST NOT be left in a position where the available footway is reduced to less than 1m and should not left in a position where the width is reduced to less than 1.5m. Bins can often be returned to a position just inside the curtilage of the property. Where this is not possible they may be left on the footway or carriageway as long as the conditions in a) and b) are satisfied. Where no viable option exists then alternative provision for the collection of waste will need to be arranged. This policy is to ensure that all road users, including pedestrians, some whom may require additional width (wheel chair users, people with buggies and shopping and those with visual impairments) are able to use the highway safely“. Here’s the reason why a change is needed. In these two following pictures there is no space for a wheelchair user of parent with a buggy to use the pavement when the current guidelines are following. In both cases it would however be trivial for the bins to be returned within the curtillage. Bin left on pavement with 400mm between bin and lamp-post. “Since October 1999 service providers have had to take reasonable steps to change practices, policies and procedures which make it impossible or unreasonably difficult for disabled people to use a service … These requirements apply to facilities and services in the pedestrian environment’. “Manual wheelchair users need sufficient space to be able to propel the chair without banging their elbows or knuckles on door frames or other obstacles. But someone who walks with sticks or crutches also needs more space than a non-disabled walker; so too does a long cane user or person carrying luggage, or a lot of shopping bags, or with small children. 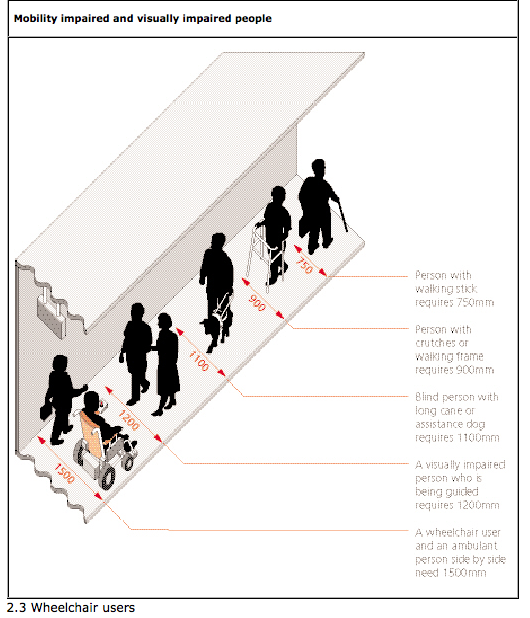 Thus providing adequate clear space on pavements, along passages in public buildings, through doorways etc, is of benefit to many people. The Equality Act 2010 provides important rights not to be discriminated against or harassed in accessing everyday goods and services like shops, cafes, banks, cinemas and places of worship… The Equality Act 2010 gives disabled people rights not to be discriminated against or harassed in relation to the use of transport services. This also covers access to travel infrastructure such as railway stations and bus stations. You also have a right to reasonable adjustments. And here is a helpful diagram published by the DfT showing the pavement width required by these different groups of pedestrians. Is it however unfortunate that the diagram is so hard to read which probably goes against their own guidance on legibility, but we can’t have everything! Finally, here are a set of photos illustrating the ‘reasonable adjustments’ that I am proposing to the council. 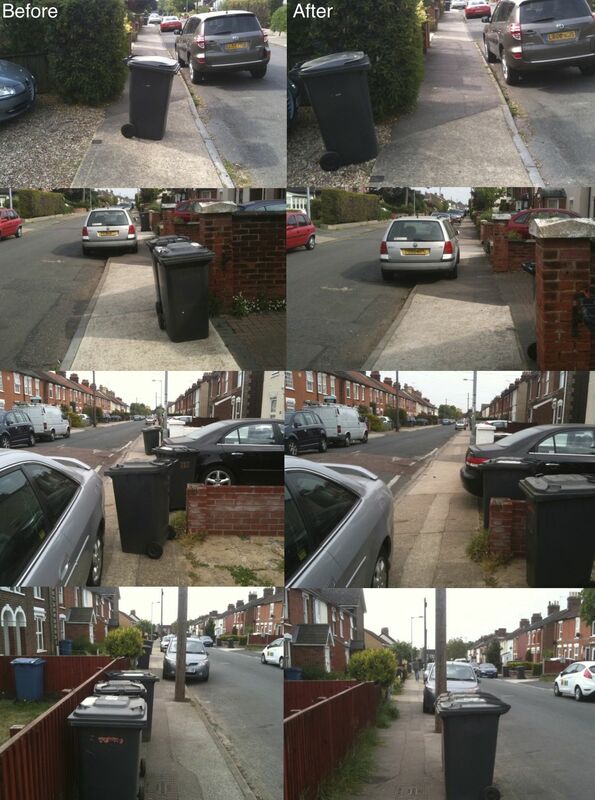 The photos on the left show where the council leave bins currently and on the right you can see where I am suggesting they should be left to allow free passage (or as good as can be achieved with all the pavement parking!). I will be sending a copy of this post to the council and ask them to reconsider. If that doesn’t work then possibly the local paper would be interested in taking this on as a local issue. Why the local council should even consider what they are doing is acceptable is beyond me, it takes no more time/effort to replace the bins back on the property where they first came from. If the council will not even consider your alternatives then publicly shaming them in the local paper is a good move. LOL Danny – you must try harder at troliing as you didn’t get a reply for over 15 months. NB – just finished a full working week, and still have time on my hands to try and save the world from itself! Then I’m off out for a 5 mile run if I can find enough pavement to run on! Anyway a question of sorts for anyone still reading; looking at the above diagram, it’s part of my quest to find out a few things about pavement width. What the diagram seems to say is that for two people to walk along a pavement it needs to be 1.2 metres wide, and I’d guess that the same is true to allow pedestrians to pass each other? Is there any history, planning requirements, etc that give guides as to how wide a pavement should be, and is there any basic reasoning behind this, eg that two pedestrians should be able to pass each other? It would make my fight with my local police and council easier if I could move them slightly away from the very subjective test of whether there is an obstruction or not. I had a lengthy conversation with my local police just now – a parent in a twin buggy had to swerve around 3 bins opposite a lampost, and because they managed it without incident, the police officer concluded that therefore the bins were not an obstruction….. So that is the level of ignorance you are up against. This is at the junction of 4 roads with the special knobbly pavement for blind people. When I said the the police officer that the bins were an obstruction for blind people, her reply was “Yeah, but you’re not blind”. I have complained to MP, councillor, and begun the Police’s complaints process. Please keep your post updated and share any tips and tactics for pursuing such complaints. The police are literally saying black is white in this case, denying that a bin is an obstruction despite someone literally being obstructed by them in front of their eyes. in this case the offence of obstruction is committed because someone actually was obstructed. It is not enough to say someone might be obstructed (unfortunately) as the statute law requires someone’s progress to be in some way impeded. The basics of whether someone’s progress was impeded can be extrapolated from the guidance on driving without due care and attention; was someone forced to swerve brake alter course or otherwise deviate from their path? Managing to negotiate an obstacle does not stop it being an obstacle. Bins are tricky as you would have to show who placed them there – it would be tricky to prosecute the entire Council. However I have found that most local authorities when looking at planning for roads go for a 2 metre wide (six foot wide) pavement, on the basis this allows two way pedestrian traffic, therefore I would suggest that any obstruction that reduced the footpath to less than 6 feet is potentially an obstruction. If I have to wait while another pedestrian uses the 3 feet the motorist has left then I have been obstructed. The Crown also has to prove that this obstruction was unnecessary – most motorists would say they were trying not to obstruct the road way. The answer to that is to drive to a place where neither the pavement or roadway are obstructed, therefore there was no necessity to drive onto any pavement.